On Monday I spent the day drawing a detailed letter V in Fry's Baskerville, for the Baskerville Project organised by David Osbaldestin at the Birmingham City University. The project is to honour the creation of the lovely Baskerville font in Birmingham in 1757. The video documentation from the day is being developed into a series of 11 animated films, which form the basis of a large scale HD multi-screen installation at Millenium Point, Birmingham, for the Hello Digital Festival. It's also being shown at the Plus Type Festival. The artwork is devised for a multi-screen installation of 11 iMacs on plinths arranged in a circle. Each iMac will be showcasing a short animated film, of each one of the artists creating their letter. What a fabulous day it was! I began the day sipping coffee, saying hello to old colleagues and meeting new chums, and ended it bashing away at my first attempt at slate-carving, covered in grey slate dust with gritty eyeballs - courtesy of the charming Gabriel Hummerstone, all the way from Devon, who was charged with doing the letter B and let me have a go on the back of his slab. (I carved the slate the way I bang nails in - a little wimpy to begin with, but switching up to a bigger bashing tool soon solved that). In between I'd watched Barry the copper-engraver from Dudley making his 'R' on a little sand-filled pocket, ancient briefcase stuffed with tools; met Evelin Kasikov the embroiderer making her 'S' from CMYK threads, seen the four pieces of Karen Lewis' 'A' come together effortlessly before my eyes, and seen Amy Brown's monoprint 'I' evolve on the desk opposite - beautiful. My 'V' was centred on the parallel development of the steel nib (my weapons of choice) which, if you don't already know, were invented in Brum in the 1700s, shortly after Baskerville. The world's steel nib industry was centred in the city, where famous names like Gillott and Mitchell made their nibs, only to meet a tragic ending when the Biro (pantomime hissing please) took over the market in the mid 1900s. The nib factories closed, tipping hundreds of thousands of nibs into the earth. Why am I not spending my weekends digging desperately with my bare hands to find them? Because they were steel, and therefore would, by now, be mere dust. I’m sure the sprits of all those unused pens still scribble away like lunatics when the sun goes down. It makes me want to cry. I was therefore pleased to be given a nice sharp consonant with which to make my point. I biked back to New Street station thinking how bloody great my job is, being given the chance to do things like this, and admiring the skills of the people I'd spent the day with. I forget - it's easy to do - how many other ways there are to make things, and just how many humans there are creating, all over the country, the world, all the time. Here's to them, and to John Baskerville himself! Meet my devastating new weaponry. 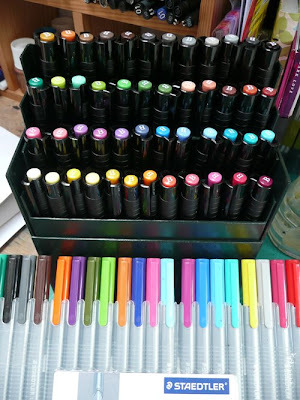 A 48-colour box of Faber Castell brush pens with raked tiering and flip-top box, fastened by paper button and thread and supplied with free bottle of felt tip magic, which I am pouring all over my new work. They are shown next to my other artillery, the Staedtler Triplus set, three years old and still the blazin' squad. 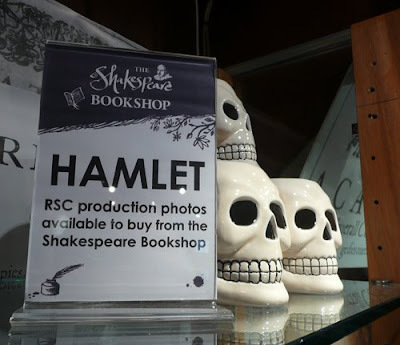 My first ever paid job after my degree was as a propsmaker for the Royal Shakespeare Company, where I moved to Stratford briefly, stitching, gluing and mackling-together giant books, Capulet party invites and man-sized snakesuits for a season's productions. I grew up with my tongue out over pages in 'The Bloody Book ' - a weighty tome of Shakey's stories adapted for children and illustrated in full blood-soaked colour by Victor Ambrus, installing a lifelong love of Ophelia (whose pose I copied in the bath), Puck, Ariel, and the Witches whose physiognomies I then turned into 3D masks at college, as part of a new campaign for The Shakespeare Birthplace Trust. 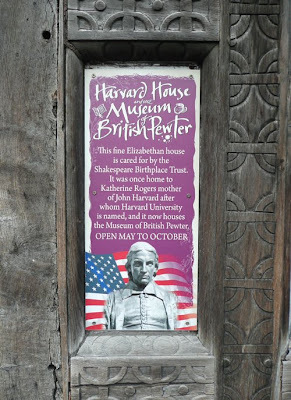 Wizz forward to 2006, and actually I did do a campaign for the Shakespeare Birthplace Trust, through Palmer Hargreaves Wallis Tomlinson in Leamington. I did tons of illustrations, a map of Stratford, Tamworth pigs, sheep, shovels, ink blots and lots and lots of lettering, to be used on leaflets advertising each of the Trust's 5 properties. You can get a feel for it here. Whoosh through another couple of years, and I've just come back from Stratford, spending a rain-sodden weekend with siblings in a Holiday Inn next to the alarmingly swollen Avon. As we wandered towards the Birthplace, siblings and I saw a sign with a familiar feel. Hey, you drawed that! shrieks sister. A sign? Wasn't in the usage, but hey, it looks smart - like what they've done with the herbs. Let's go inside. Oh, it's on a guide book too? OK...and look! A bookmark with my work on? A postcard set? 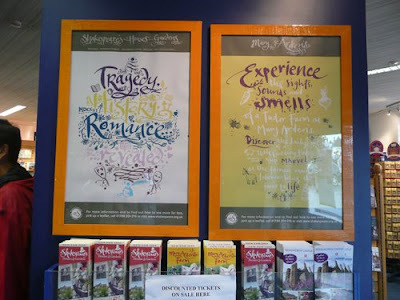 Big posters in the Tourist Office! 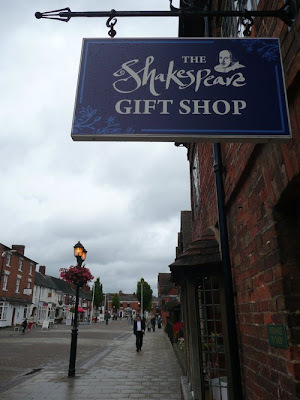 As we walked around Stratford you couldn't avoid stumbling across some scribble or other by Inkymole, writ large and dangling overhead. 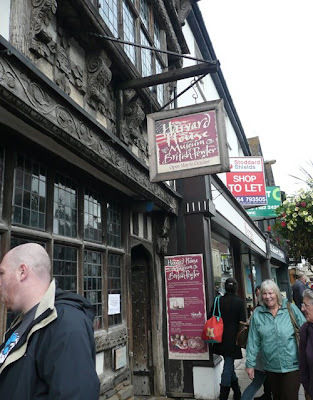 The bus tour revealed more and more - I'm sure I spotted my Tamworth pig blown up into a poster somewhere around Anne Hathaway's cottage. This is extremely pleasing to see (the signs on every house look lovely), and a gentle ambition fulfilled. Watching American tourists pose for family photos underneath signs brought a glow to my cheeks. I wasn't paid for quite such a vast spread of applications of the work - let's say it's more than a little beyond the scope of the original licence - but the Trust are benefitting from every new body through the door and every bookmark sold, and if my pen has helped another oak beam stay put, or added another few years to the life of a precious artefact, I'm happy. Now I am off to lie dead in the bath with pond weed around me.